The South Fork Coos and Millicoma Rivers provide the largest source of fresh water to the Coos estuary. Coastal upwelling and tidal exchange help drive estuarine productivity. Their benefits can be greatly affected by cyclical oceanic/climate variations (e.g., El Niño, Pacific Decadal Oscillation). 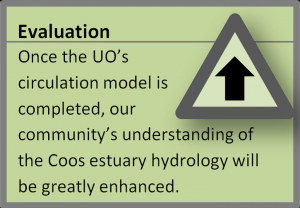 A hydrodynamic (circulation) model will soon enable scientists and coastal managers to investigate the affects of planned or anticipated future changes on the Coos estuary. Storm-driven waves break at the entrance to the Coos estuary. Tide gate regulates tidal flooding at Willanch Slough. 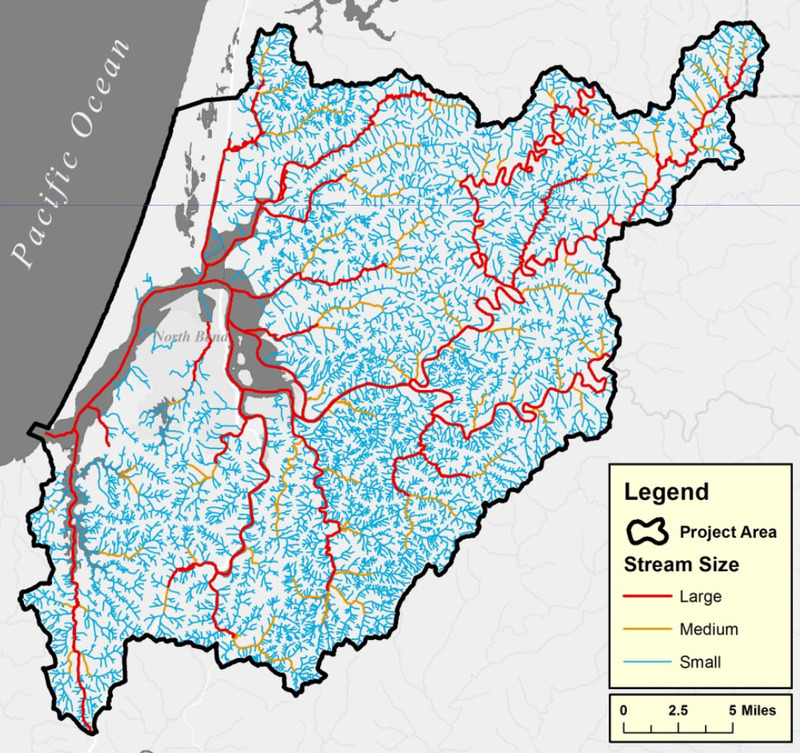 This data summary describes the information that allows scientists, resource managers, landowners, developers, and other stakeholders to understand the behavior of water in the lower Coos watershed. It also describes the monitoring and modeling which provide users with hydrology-related data, including river and stream discharge, tide information (timing, tide heights, current velocity and direction), and water temperature and salinity patterns (daily/seasonal) in the Coos estuary. 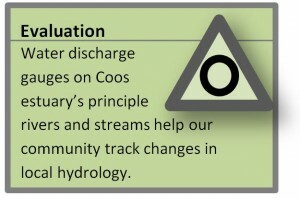 The Coos estuary is the project area’s dominant hydrological feature; it is the water body into which all the hydrological elements associated with the lower Coos watershed (e.g., ocean, rivers, streams, groundwater) are either directly or indirectly connected (Figure 1). Water movement in the Coos estuary is controlled primarily by ocean and fluvial (river) forces, but is also greatly influenced by the estuary’s bottom contours (bathymetry), wind direction and speed, and climate-related processes, such as coastal upwelling, El Niño, and Pacific Decadal Oscillation. Each of these controlling factors affects: 1) how well-mixed water salinity and temperatures are between the estuary’s surface and deeper waters (vertical mixing); 2) how stratified the estuary is (how often denser waters (high salinity and low temperature) are separated in the estuary’s water column from lighter waters (low salinity and high temperature)); 3) what the residence time for estuarine waters is (how long water resides in the estuary or how rapidly it gets flushed out); and 4) how swiftly and in what directions the estuary’s tidal and fluvial currents flow. gaging stations maintained by Coos Watershed Association. The timing and duration of these physical conditions largely determine which estuarine plant and animal communities become established in and near the estuary. The status of these estuarine plant and animal communities can greatly influence our local community’s commercial and recreational activities. The Coos estuary changes remarkably with the seasons. For example, the Coos estuary is considered to be vertically well-mixed in the summer and partially mixed in the fall. In the winter the estuary is considered highly stratified; bottom waters, especially in the lower estuary, largely consist of a tidally-driven “salt wedge” separated from fresher surface waters (O’Neill and Sutherland 2015). 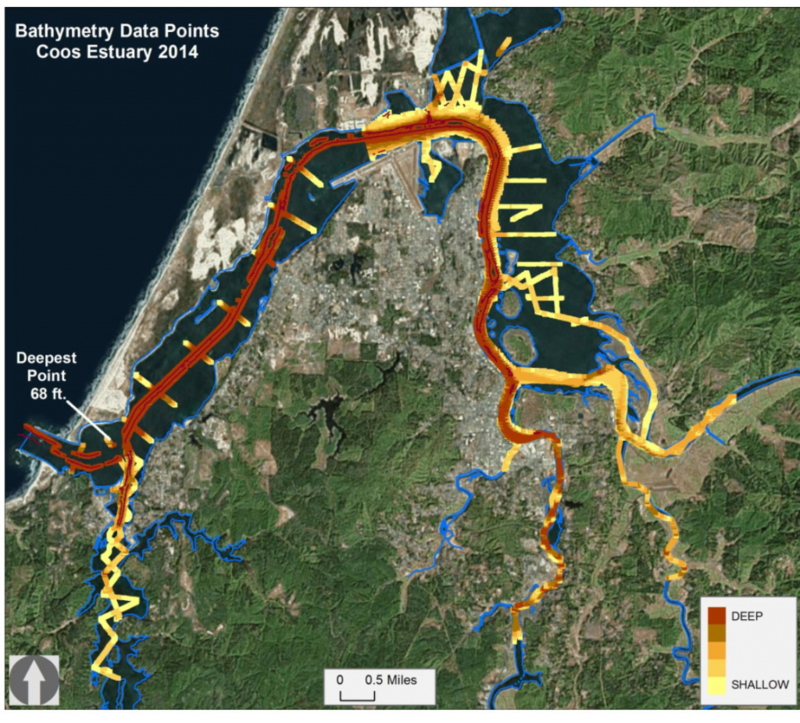 A newly developed computer-based hydrodynamic model is helping us understand Coos estuary’s water movement patterns. Ultimately, this system could be used to help predict the environmental effects and commercial costs associated with development or conservation proposals associated with the Coos estuary, as well as helping plan for catastrophic coastal hazards such as earthquakes and tsunamis. Dr. David Sutherland, Assistant Professor of Geological Sciences at the University of Oregon, has nearly completed this project as of summer 2015. It is a three-dimensional model of the Coos estuary (Figure 2), and consists of a high resolution Coos estuary-shaped three-dimensional digital grid into which Dr. Sutherland loads river discharge, surface and bottom water temperature, salinity, tidal current velocity and direction from data loggers deployed in the estuary and local rivers and streams. Modeling software processes these very large data sets so that eventually, the model will be a closely accurate representation of the estuary’s year-round behavior, including water circulation and associated attributes (temperature, salinity). When the model is complete, it could be used to inform local stakeholders’ decision making associated with issues local community members have expressed interest in such as: the likely affects of sea level rise on coastal developments; the extent and speed at which spilled oil spreads under different weather and tide conditions; seasonal or long term water quality variations in nearshore ocean and lower estuary waters where hypoxic (low dissolved oxygen) areas persist; Dungeness crab larvae dispersal patterns; the potential effects on commercial oyster cultivation associated with relocating the secondary wastewater treatment plant outfalls elsewhere in the Coos estuary (Sutherland n.d., C. Cornu pers. comm. 2015). In 2013-14, South Slough National Estuarine Research Reserve (SSNERR) staff deployed and maintained numerous instruments to help Sutherland validate his Coos estuary hydrodynamic model. They set up water level, temperature, and salinity instruments for one year at various locations in lower and mid-Coos estuar y. They also deployed as an acoustic Doppler current profiler (ADCP) for one year in the lower estuary to collect local water current velocity and direction data (Figure 3)(SSNERR 2015). Sutherland has incorporated these usable data into the model. River discharge data, managed by the Coos Watershed Association (CoosWA), were also used to validate the model and are discussed in more detail below. The ADCP water current velocity data clearly show the cyclical nature of water currents in the Coos estuary (Figure 4). 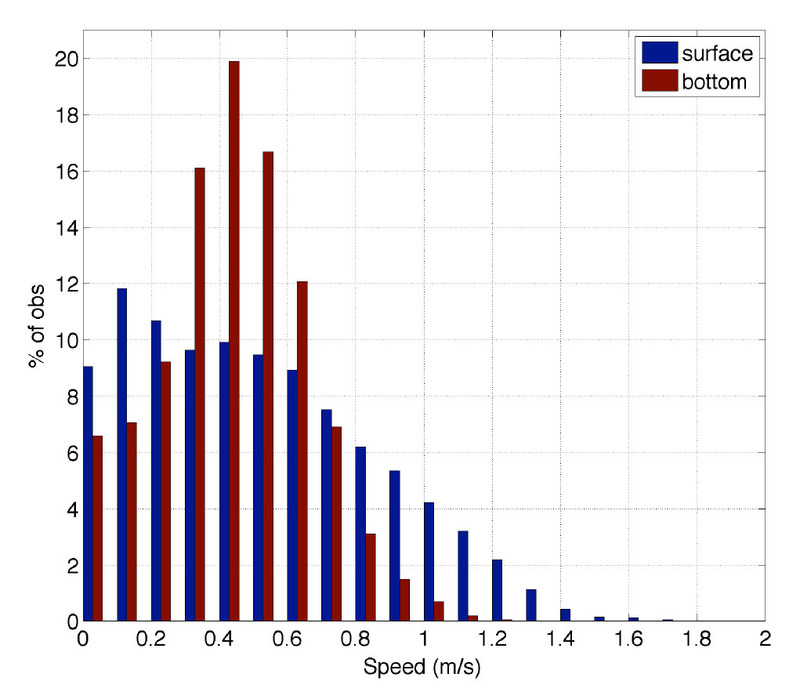 Differences in water surface velocity (at a depth of about 2 m) compared to bottom velocity (at about 8 m) are also apparent (Figure 5). While both surface and bottom currents moved at about the same average velocity (0.5 m/s and 0.45 m/s respectively), data show surface waters moved more often at greater velocities than bottom waters (D. Sutherland pers. comm. 2015). The highest observed surface water velocity was 1.8 m/s, while the highest observed bottom velocity was 1.2 m/s. Velocities in the Coos estuary are strongly linked to rising and falling tides. Therefore, patterns are more closely linked with the lunar cycle than with seasonal changes. Other non-tidal forcings that do have a seasonal component, such as river discharge, also affect velocity; however, these currents are much slower than tidal currents (averaging 0.1 m/s)(D. Sutherland pers. comm. 2015). Figure 2. Computer screenshots of the prototype of the Coos estuary hydrodynamic model showing water surface salinity before, during and after a freshwater discharge event. Salinity color legend is shown at right. Sutherland 2013. Figure 4. Depth-averaged speed of estuarine water over time. 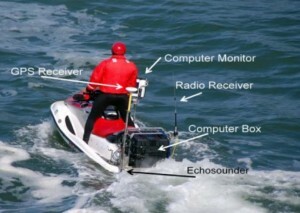 Different colors represent individual deployments of the acoustic Doppler current profiler (ADCP). Figure: Sutherland 2015; Data source: SSNERR 2015. Water movement in the Coos estuary is greatly affected its bottom contours, or bathymetry. Available Coos estuary bathymetry data come from the United States Army Corps of Engineers (USACE) and Oregon State University (OSU). USACE surveys indicate that the estuary’s average depth is nearly -8.5m (-28 ft) relative to North American Vertical Datum of 1988 (NAVD88); the deepest part of the estuary measures -20.7m (-68 ft) NAVD88 near the mouth of the Coos estuary (Figure 6). It should be noted that because the USACE surveys are designed to characterize the bathymetry of Coos Bay’s commercial shipping channel, they focus their efforts on the deeper parts of the estuary (although their surveys extend slightly into shallower regions around the estuary’s northern bend). Therefore, USACE’s depth averages are likely greater than the actual average depth of the Coos estuary (USACE 2014). Figure 5. Surface (2 m depth) vs. bottom (8 m depth) speeds as measured by the acoustic Doppler current profiler (ADCP). Figure: Sutherland 2015; Data source: SSNERR 2015. Very little information is available for the shallow portions of the estuary that extend laterally beyond the regularly dredged shipping channel. The information we do have has been provided by OSU scientists, who completed 35 transects across the estuary in 2014 using their Coastal Profiling System. This system pairs high speed personal watercraft with echo sounder and Global Positioning System (GPS) instruments, allowing them to survey shallow parts of the estuary that larger survey vessels are unable to navigate (Figure 7). Their deepest point was similar to USACE’s in both location and depth: -20.5 m (-67 ft) NAVD88 near the mouth of the estuary. The shallowest points were -0.9 m NAVD88. The average depth of all their survey points (both channel and shallow data) was -3.9 m (-12.8 ft) NAVD88. Figure 6. Known bathymetry of the Coos estuary. The estuary boundary is outlined in blue. Data came from regular U.S. Army Corps of Engineer hydrographic surveys, and bathymetry surveying conducted by Oregon State University in 2014. 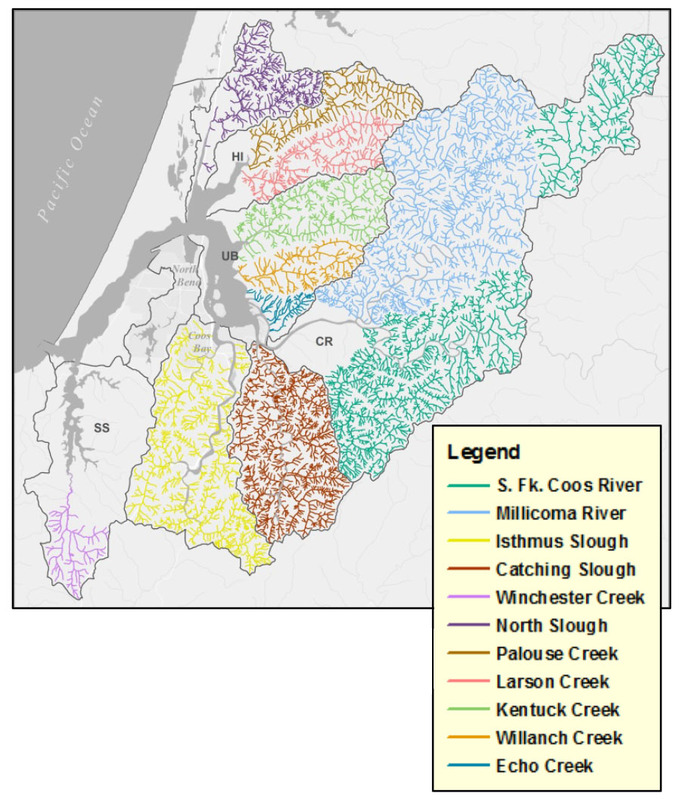 Tides affect Coos estuary hydrology as far into the project area as Allegany on the Millicoma River, and near Dellwood on the South Fork Coos River. 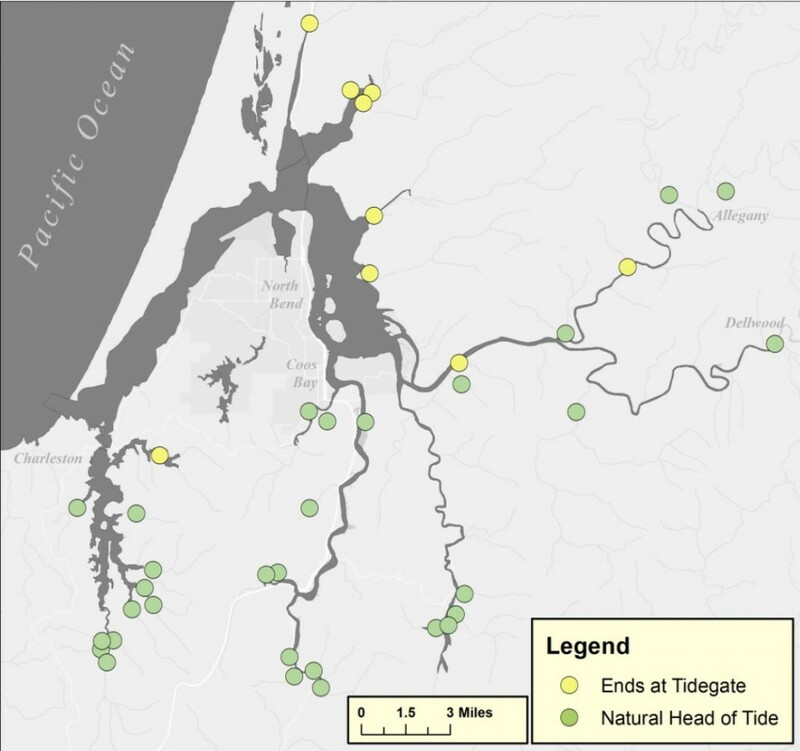 In the northeast portion of the Coos estuary, most major “heads of tide” (the transition zone between tidal and non-tidal waters) end at tide gates (Figure 8)(DSL 2014). The exact location of heads of tide can vary. Wind-driven storm surges and heavy precipitation (high river stage) can affect the upper reaches of the tide’s influence. The Coos estuary is subject to mixed semi-diurnal tides (i.e., two unequal low and two unequal high tides per day). The maximum observed tide at NOAA’s Charleston station, near the mouth of the Coos estuary, was in January 1983 at 3.408 m (11.7 ft) above mean lower low water (MLLW)(Figure 3)(NOAA 2015b). For comparison, the average of all higher high tides is 2.323 m (7.62 ft) relative to MLLW. The minimum observed tide of -0.941 m (-3.01 ft) relative to MLLW occurred in May 2003. The mean tide range at the Charleston station (i.e., difference in height between mean high water and mean low water) is 1.7 m (5.7 ft). The mean diurnal tide range (i.e., difference in height between mean higher high water [MHHW] and MLLW) is 2.3 m (7.6 ft)(NOAA 2015b). Tide range decreases the greater the distance from the mouth of the estuary. In the upper Coos estuary, mean diurnal tide range is approximately 10 cm smaller (2.2 m) than the mean diurnal tide range at Charleston (Rumrill 2008). As mentioned previously with respect to heads of tide, tidal range varies depending on oceanographic conditions. Strong southerly winds can cause lower than expected tides, while strong summer winds can cause higher than predicted tides (Rumrill 2008). Changes in sea level also affect tidal range. Mean tidal height (i.e., sea level), as measured at NOAA’s Charleston station, (located at the mouth of the South Slough near the ocean) has risen since 1970 at an average rate of 0.84 mm/yr (0.03 inches/yr)(Figure 9)(NOAA 2015b). This rate is equivalent to a 0.27 ft (3.3 inches) increase in 100 years. The rate of sea level rise is expected to accelerate due to climate-related changes, including thermal expansion caused by the warming of the oceans and melting of land ice (e.g., glaciers, continental ice sheets)(OCCRI 2010). Figure 8. Approximate major head of tide locations for the Coos estuary. It should be noted that these approximate locations were identified using distinctively qualitative methods: e.g., “best professional judgment” observations from single site visits or recollections of local landowners. Data: DSL 2014. Both sea level and tidal action also greatly influence the residence time of water in the Coos estuary. Residence time is an indicator of an estuary’s status. Short residence times indicate well-flushed estuaries which tend to be more resilient to circumstances affecting water quality (e.g., point and non-point source pollution including excessive nutrient inputs) than those less well-flushed estuaries. Arneson (1976) calculated flushing times for the Coos estuary and, unsurprisingly, found that residence times in different parts of the estuary was highly dependent on: 1) distance from the mouth; 2) river discharge; and 3) tidal range. For example, it took approximately 6 days for water to flush from the Coos estuary at river mile 7.6 (near North Bend) during high river flow and relatively high tidal range, while this same task took 19 days during low flow/tidal range. On average, 31% of the water (at MHW) drains from the Coos estuary during the ebb tide, highlighting the tide’s dominant role in flushing the Coos estuary (NOAA 1985 as cited in Hicky and Banas 2003). This tidal prism (volume of water that leaves an estuary during ebb tide) is considered large. It is markedly different from estuarine systems on the East Coast, but smaller than many other Pacific Northwest estuaries. For example, Narrangansett Bay, a large estuary in Rhode Island, has a tidal prism of 10%, while similarly sized Willipa Bay (WA) has a tital prism volume of 50% (NOAA 1985 as cited in Hicky and Banas 2003). 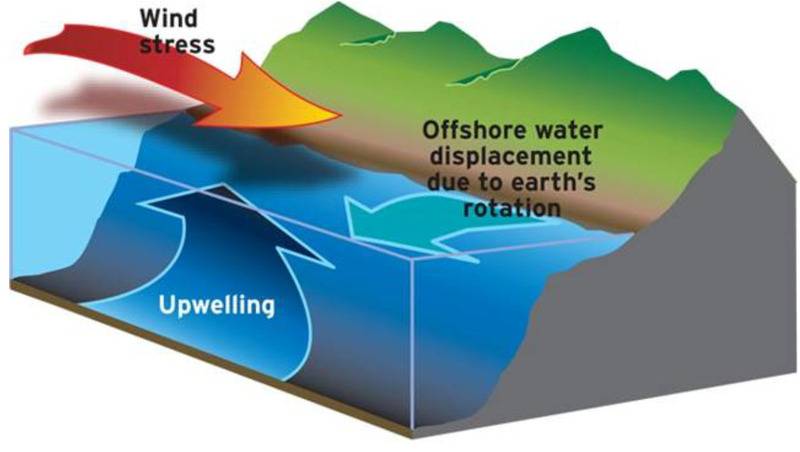 An important spring and summertime phenomenon, coastal upwelling occurs when strong north winds push surface ocean waters offshore, allowing colder, nutrient-rich bottom waters to rise to the surface (Figure 10). The timing and duration of upwelling events has been linked to Dungeness crab production and abundance of returning adult salmon (NWFSC 2015). Figure 10. Depiction of coastal upwelling forces along Oregon’s coast. Source: NWFSC 2015. NOAA’s Northwest Fisheries Science Center (NWFSC 2015) provides the most up-to-date information on upwelling patterns along the Pacific Northwest coast and calculates upwelling indices using data that measure the strength and direction of surface wind stress. 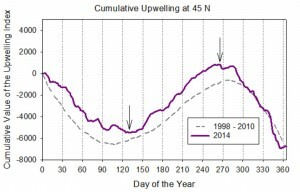 Their most recent cumulative upwelling index quantifies the late start date (spring transition) and early end date (fall transition) for 2014 upwelling events. Generally, the earlier the start date for the spring transition, the higher the primary productivity will be that year (allowing for higher oceanic salmon survival). The average date of spring transition is April 13th (103rd day of the year). Despite the later than average spring transition, total upwelling for 2014 was normal (6,326 m3/s per 100 m coastline) when compared to the 40-year average (6,163 m3/s per 100 m coastline)(Figure 11). No data are available describing the status and trends of Coos estuary or south coast Oregon upwelling. Figure 11. 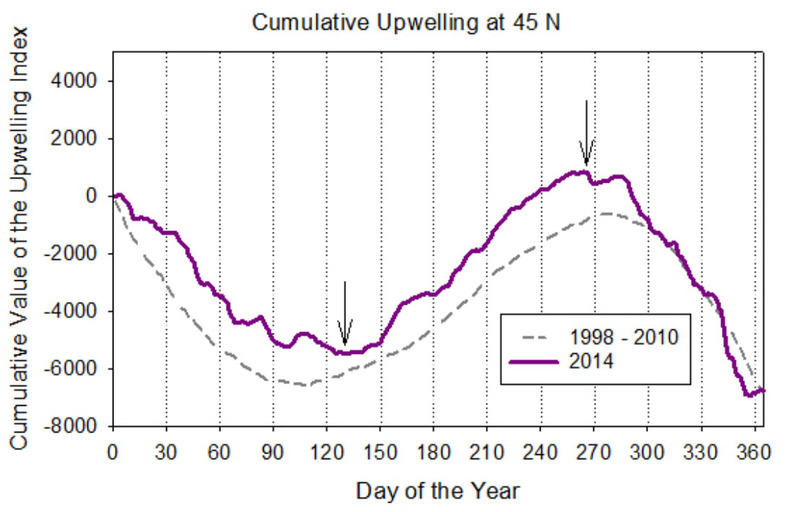 Cumulative upwelling plot for the Pacific Northwest (45oN) in 2014. Upwelling events occur between the days designated by the two arrows (spring transition: early May; fall transition: mid-October). Cumulative upwelling plots add the amount of upwelling (m3/s per 100 m coastline) on day 1 (January 1st) to that of day 2, and so on. Thus, days with upwelling move the curve up while days with downwelling move the curve down. Source: NWFSC 2015. Downwelling is the reverse process, in which strong south winds push warm, nutrient-poor surface waters closer to shore. It results in poor primary production and occurs during the winter season. Figure 12. 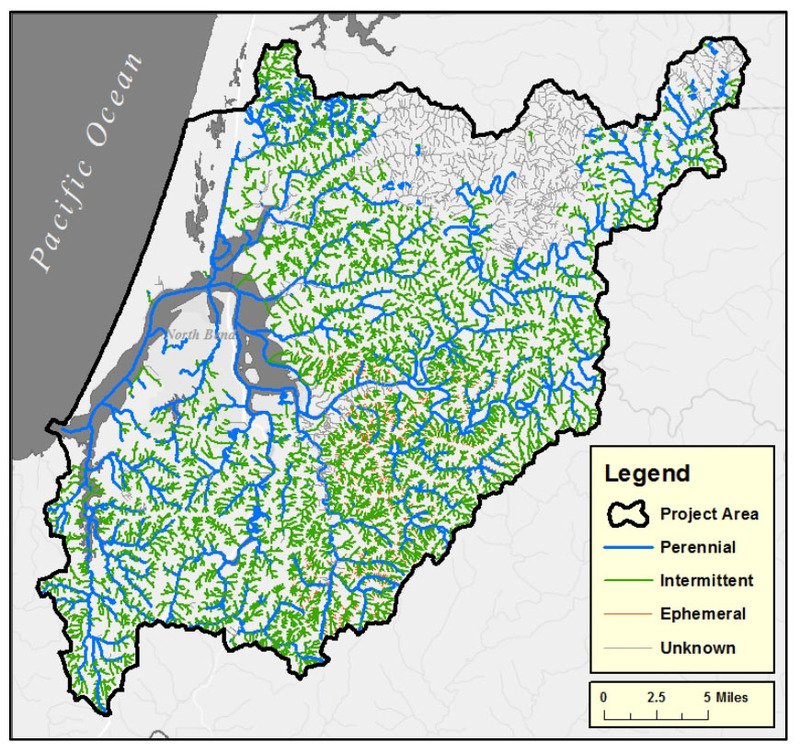 Location of stream types in the project area. Data: ODF n.d. There are approximately 1,700 miles of rivers and streams in the project area (Figure 1)(ODF n.d.). Nearly 1,000 miles are intermittent streams (streams that only flow part of the year), providing highly seasonal sources of freshwater to the estuary (Figures 12 and 13). Approximately 400 miles are perennial rivers and streams (flowing year-round). Nearly all seasonal variations in river and stream flow come from rainfall; snowmelt plays almost no role in project area hydrology (Hickey and Banas 2003). Historical estimates of total freshwater flow at the mouth of the Coos estuary have been made using extrapolations of the Millicoma River streamflow data collected by the United States Geological Survey (USGS)(1955-1981). Using these data, Percy and colleagues (1974) reported that on average about 2.2 million acre-feet of freshwater are discharged annually (Percy et al. 1974). Figure 14. Distribution of watersheds where stream flow (discharge) has been measured. Subsystems mentioned in the report are labeled: HI (Haynes Inlet); UB (Upper Bay); CR (Coos River); SS (South Slough); CS (Catching Slough); IS (Isthmus Slough). 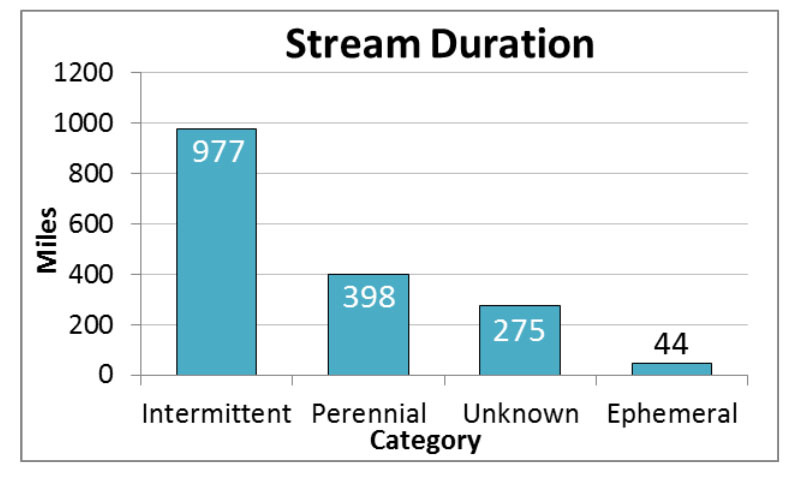 Data: ODF n.d.
CoosWA currently collects stream discharge data from gauging stations on six lower Coos watershed rivers and streams (Figure 3). These data helped the CoosWA assess 10 Coos estuary tributaries in support of their watershed restoration programs (CoosWA 2006, 2008, 2011). Tributaries assessed were: North Slough, Palouse and Larson Sloughs (in the Haynes Inlet subsystem); Kentuck and Willanch Sloughs, and Echo Creek (in the Upper Bay subsystem); Millicoma and South Fork Coos Rivers (in the Coos River subsystem); and Catching and Isthmus Sloughs (Catching Slough and Isthmus Slough subsystems)(Figure 14). 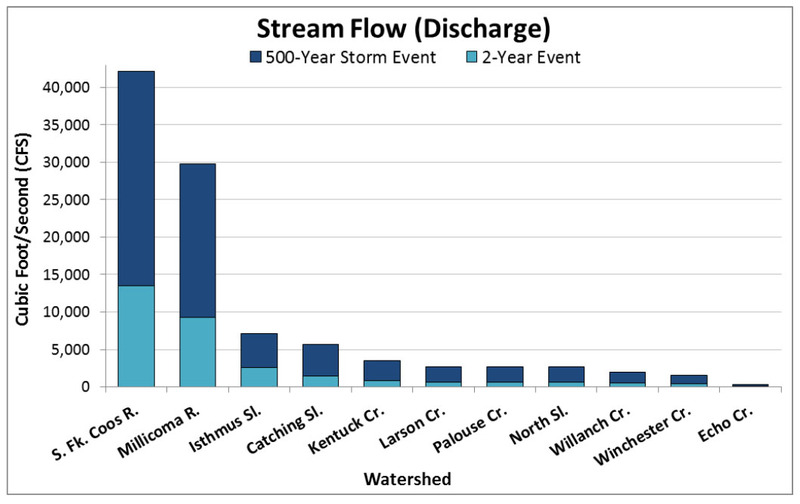 Stream discharge data for Winchester Creek in the South Slough subsystem are also included (USGS 2015). These data confirm the South Fork Coos and Millicoma Rivers as the principle freshwater contributors to the Coos estuary. South Fork Coos and Millicoma River discharge estimates for a two-year storm event are 13,500 and 9,330 cubic feet per second (cfs) respectively (Figure 15). During a 500-yr storm, estimated river discharge reaches 42,200 and 29,800 cfs respectively. 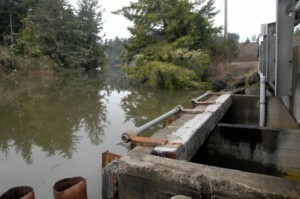 Echo Creek, the smallest tributary to the Coos estuary assessed releases 69 cfs of water during a two-year storm event and 310 cfs of water during a 500-year event. tributaries to the Coos estuary. Data source: CoosWA 2006, 2008, 2011; USGS 2015. Figure 13. Miles of streams in the project area categorized by duration; intermittent streams hold water in the wet season, perennial streams flow year round, and ephemeral streams only hold water immediately following rain events. 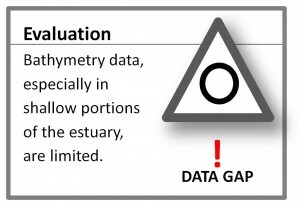 Data: ODF n.d.
Bathymetry data are required for many commercial and recreational activities associated with navigating, understanding and managing estuaries. These activities include developing navigation charts, hazards mapping, classifying habitats and estuary use zones, and hydrodynamic modeling. In addition, bathymetry data collected from both the nearshore ocean and the estuary help scientists model the effects of potential tsunamis and sea level rise. As mentioned, UO’s hydrodynamic model for the Coos estuary, a tool which will ultimately be useful in many of the applications described above, is validated using field data (e.g., stream discharge, water temperature and salinity, wind speed and direction, water current speed and direction). For an accurate working model to be created, those data need to be used with precise, complete bathymetry data set that very closely characterize Coos estuary’s bottom contours. Pacific ocean tides directly and indirectly affect human communities living around the Coos estuary. Local communities have long built and maintained sea walls, tide gates, jetties and other shoreline structures designed to withstand the largest expected tidal surges. Ships plan port arrivals and departures, and navigate through estuaries and coastal waters, based on their knowledge of tides and currents. Tides influence the design of habitat restoration projects. Fishermen know that various commercial and recreational fish species concentrate, migrate through, or spawn in different parts of the estuary depending on many factors, including the timing and magnitude of tidal fluctuations associated with those habitats (NOAA 2014). High tides during storms can exacerbate the erosion of beaches and sand dunes, or re-position the stream outlets blocked by drifting sands. Tidally-driven estuarine flushing rates are important for understanding how long pollutants will remain in the estuary (Arneson 1976). Tidal exchange plays an important role in distributing macronutrients throughout the estuary; these nutrients maintain estuarine productivity and influence the structure and well-being of marine and estuarine communities, especially during upwelling events. In a study of Washington and Oregon’s outer coast estuaries, Hickey and Banas (2003) examined various factors that influence estuarine productivity, including nutrient sources (i.e., whether riverine or marine), currents and upwelling patterns, the difference in area and bathymetry of the continental shelf off Oregon and Washington, and estuarine tidal regimes. They found that cold, nutrient rich water upwelling from off the continental shelf and carried into the estuaries by tides is the principal source of nutrients for estuaries of the Pacific Northwest coast. This is in stark contrast to the large, eastern seaboard estuaries such as Chesapeake or Delaware Bays, where large rivers deliver the bulk of nutrients to the estuaries. By comparison, even the largest outer coast estuaries in the Pacific Northwest (e.g., Coos estuary, Grey’s Harbor, Willapa Bay) are small enough to be thought of as extensions of the coastal ocean. The Coos estuary is greatly influenced by coastal upwelling. The strength of upwelling is moderated by recurring variations in hemispheric ocean and climate conditions such as the Pacific Decadal Oscillation (PDO). PDO conditions shift between cool and warm phases every 20-30 years. Strong upwelling tends to occur during the cool phases, while during warm phases upwelling is less intense. Since NOAA’s Pacific Fisheries Environmental Laboratory began collecting data in 1947, the strongest Pacific coast upwelling events were recorded in 1965-67 (the corresponding cool phase lasted from 1947 to 1976). The last significant warm phase occurred from 1976-1997; in 13 of those years, upwelling was unusually weak. Normally, upwelling brings nutrient-rich water to the surface, and that, in turn, fuels the productivity that supports life in the upper layers of the ocean. For example, Gunsolus (1978) and Nickelson (1986) first showed a predictable relationship between upwelling and the survival of Coho salmon (Oncorhynchus kisutch). However, other hemispheric ocean and climate processes, such as El Niño, can adversely affect upwelling. During El Niño events, unusually warm water appears off the coast of South America, affecting regional ocean and climate conditions. 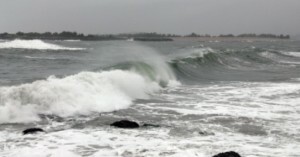 Scientists initially thought El Niño to be a local effect. Now with its cool-water counterpart, La Niña, El Niño is a recognized part of a large, global climate system known as the El Niño-Southern Oscillation (southern oscillation refers to a shifting of surface air pressure between the western and eastern parts of the Pacific Ocean). A strong El Niño may affect weather and climate around the Pacific ocean, including the occasional appearance of unusually warm water off the Oregon coast at times when upwelling is occurring (NOAA 2015a). During the strong 1998 El Niño, upwelling was relatively robust, yet plankton production was weak, which greatly affected Pacific coast biological communities. This phenomenon occurred because the deep, cold nutrient-rich waters that typically rise to the ocean surface were replaced during the El Niño event by warmer, nutrient-poor water (NOAA 2005). Freshwater inputs to the Coos estuary are affected by watershed conditions. When land is modified (e.g., timber harvests, agricultural practices, road construction, development) watershed hydrology can be affected to varying degrees depending on land modification scale and methods, watershed geology, soil types, vegetation cover, topography, and runoff rates (CoosWA 2006). Contemporary land modification/management practices are designed to minimize negative impacts to watershed hydrology and other important natural processes. Among the concerns of land owners and resource managers alike are storm-related increases in peak stream and river flows exacerbated by poor land management practices. The primary factor determining peak stream flow is the ability of watershed soils to absorb rainfall, which in turn depends on the management of vegetative cover, land uses, the characteristics of the soil (CoosWA 2006) and the amount and duration of rainfall. Increases in runoff can result in loss of property, vegetation and wildlife habitat, flooding, erosion and landslides (CoosWA 2006, DOGAMI 2008). Additional information about landslides can be found in this chapter’s Geology Data Summmary. Coos Watershed Association (CoosWA). 2006. Coos Bay Lowland Assessment and Restoration Plan. Coos Watershed Association, Charleston, Oregon, pp. 47, 70, 93. Coos Watershed Association (CoosWA). 2008. Catching Slough, Daniel’s Creek and Heads of Tide Sub-basin Assessment and Restoration Opportunities. Coos Watershed Association, Charleston, Oregon. 144 pp. Coos Watershed Association (CoosWA). 2011. Isthmus and Coalbank Slough Sub-basin Assessment and Restoration Opportunities. Coos Watershed Association, Charleston, Oregon. 99 pp. Gunsolus, R. T. 1978. The status of Oregon Coho and recommendations for managing the production, harvest, and escapement of wild and hatchery reared stocks. Oreg. Dep. Fish Wildl. Fish Div. Proc. Rep., Portland, OR. 59p. Oceanography and Marine Assessment, National Ocean Service, Rockville, Maryland. Nickelson, T. E. 1986. Influences of upwelling, ocean temperature, and smolt abundance on marine survival of Coho salmon (Oncorhynchus kisutch) in the Oregon Productio Area. Can. J. Fish. Aquat. Sci. 43: 527-535. Oregon Climate Change Research Institute (OCCRI). 2010. Oregon Climate Assessment Report. K.D. Dello and P.W. Mote (eds). College of Oceanic and Atmospheric Sciences, Oregon State University, Corvallis, OR. Oregon Department of State Lands (DSL). 2014. Digitized revision of: DSL. 1989. 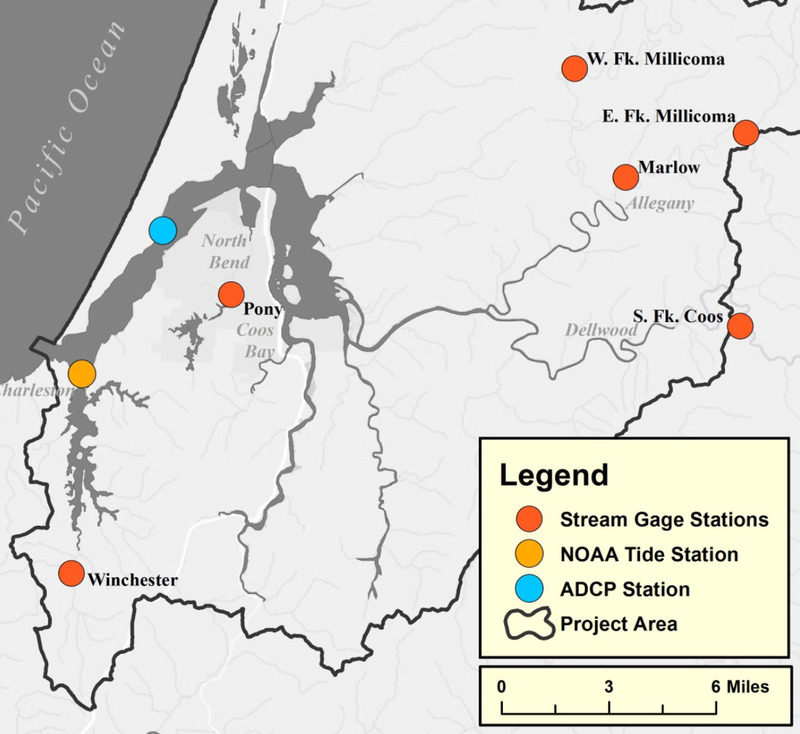 Heads of Tide for Coastal Streams in Oregon. Percy, K. L., D. A. Bella, C. Sutterlin, and P. C. Klingeman. 1974. Descriptions and information sources for Oregon estuaries. Sea Grant College Program, Oregon State University, Corvallis, Oregon. Rumrill, S. 2008. Ecology of the South Slough Estuary: Site profile of the South Slough National Estuarine Research Reserve. South Slough National Estuarine Research Reserve 259 pp. South Slough National Estuarine Research Reserve (SSNERR). 2015. [ADCP data 2013-2015]. Unpublished data. Sutherland, D. 2015. [Plots of ADCP data]. Unpublished data.